The Peg Harness provides the ultimate in transport security when combined with the Bar Harness. It essentially takes the weight of the bike out of the equation, leaving the Bar Harness to just keep the bike upright. No need to compress the forks. No need to tie the back of the bike down. No need for a wheel chock. No worries! 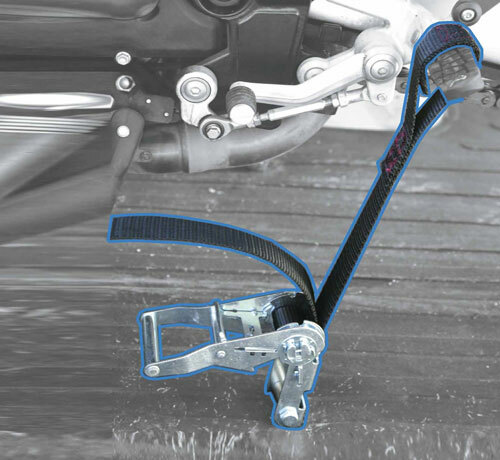 The Peg Harness pulls the weight of the bike down by the foot pegs or floor board brackets which keeps the front wheel straight by virtue of the steering geometry. A combined downward pull of only about 100 pounds is all that is necessary to secure the heaviest bike. That’s is less weight on the pegs than when standing on them. If you don’t have at least 8 inches of floor-to-peg clearance, you can use the Remote Anchor Peg Harness configuration which only requires 4 inches of clearance. We sell the Peg Harness retail/direct because we have found that custom configurations and sizes are most often necessary. Custom doesn’t mean expensive. It just means you get a product that works well for you at no additional cost. Give us a call or use the “contact/support” page. We accept plastic! While we don’t offer retail direct sales except for the Peg Harness you can find Canyon Dancer products at many retailers. Check our Retailer List to find local or online stores. If you are a retailer and would like to carry Canyon Dancer products, please refer to our Distributor List. You will most likely find your favorite distributor listed there. If you are a retailer and would like your company added to our list, please send us your address or a link to your site. We have been in business since 1993 and pride ourselves in offering exceptional customer service and products we make ourselves right here in the United States of America. Why can’t I just use the Peg Harness by itself ? The stress on the truck bed when you make a turn is redirected from being equal on both sides, to all on one side. The Bar Harness, while not compressing the forks, keeps the bike vertical and serves to equal out the pull on the truck bed. Tie down is simple once the Bed Bolts are in place. Download the complete installation instructions for the Peg Harness. Screw the ratchet and yoke assemblies into the two Bed Bolts by hand. Position the bike with the foot pegs directly over the ratchets and install the Bar Harness to steady the bike. Slip the loops in the webbing over the foot pegs and adjust the ratchets so the bike is vertical and there is a combined downforce of about 100 pounds on the foot pegs. Adjust the Bar Harness so the straps don’t flap in the wind and you are ready to go. To release the bike, release the Peg Harness ratchets first, leaving the Bar Harness to steady the bike. Standing over the seat, or to the left of the bike, lower the side stand and release the right side of the Bar Harness. Then release the left side and allow the bike to rest on the side stand. Be sure to use the Bar Harness or other tie downs to add stability and prevent damage to the bed of your truck. The Peg Harness allows your bike to be tied down without having to overly compress your forks or shocks but should never be used alone.